Part One of the survey asks students about their experiences with tobacco. It consists of questions taken from the CDC’s National Youth Tobacco Survey (NYTS) 2004 Questionnaire—a survey that can be used to estimate current use of tobacco products and selected indicators related to tobacco use among U.S. middle school and high school students. 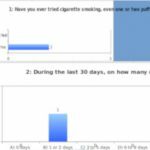 These surveys are periodically done by the government to assess tobacco use. The complete survey and reports are available online here. Part Two of the survey includes open-ended questions that ask students what they think or know about the prevalence and health consequences of tobacco use, quitting, and why young people use tobacco. Once you have completed all activities, please delete or dispose of all student tobacco surveys. Early adolescence is a time when significant changes in attitudes and behaviors are typical. 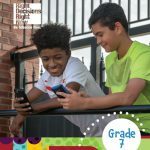 One of these behaviors may involve experimentation with tobacco.3 At the same time, young people are becoming more independent and may start to spend more time with their friends. They will get a lot of their information (or misinformation) from their friends, potentially causing them to make decisions they will later regret. Teaching students the health consequences of tobacco use in this program is one important way to communicate the facts and help them make the decision to be tobacco free. Since the survey asks students about their personal experience with tobacco, it should be done independently and anonymously. Assure students that no personally identifying information will be included in the survey they email to you. What have you learned about tobacco? Then, direct students to the online survey in the website by clicking “Launch Activity” below. We recommend emailing the link to your students, posting it on a class web page, projecting it on an interactive whiteboard, and/or writing it on a chalkboard. Once the survey is complete, share with your students the facts listed in the answer key part of the “Wrapping Up” section to dispel misperceptions they may have about tobacco use, and to reinforce the message that most young people are tobacco free. Also, encourage students to volunteer answers during your discussion if they feel comfortable. Answers will vary. Review the answers students provided for questions 1–8. This will give you a sense of your students’ experience with tobacco, but it should not be shared with the students. 6–7. Explain to students that some young people try tobacco because of a “lack of self-efficacy in the ability to refuse offers to use tobacco,”4 or they don’t know how to tell their friends they don’t want to try it. 8. 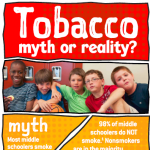 Explain to students that there are health consequences related to tobacco use. According to the Surgeon General, symptoms such as coughing, shortness of breath, nausea, and phlegm production can develop in young people who smoke.4 Tell them that they will learn more about the health consequences in Activities 2 and 3. If students want to volunteer answers, write them on the board and then revisit the list when you read Activity 2. Students will learn more about addiction in Activity Three. To assist you with evaluating your students’ anonymous responses to this tobacco survey, we have created a data-collection spreadsheet that will allow you to input and view quantitative and qualitative measures. 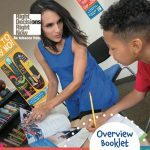 Click here to access the downloadable survey-response spreadsheet. You’ll also find it in the “Materials” section below. 3 Simons-Morton, B. (2004). The protective effect of parental expectations against early adolescent smoking initiation. Health Education Research, Vol 19, no. 5, pages 561-569. 6 U.S. Department of Health and Human Services. Preventing Tobacco Use among Young People: A Report of the Surgeon General. Atlanta, Georgia: U.S. Department of Health and Human Services, Centers for Disease Control and Prevention, National Center for Chronic Disease Prevention and Health Promotion, Office on Smoking and Health, 1994.